The 25th Anniversary, or Anniversario in Italian, was the last and most agressive countach made. 627 examples were produced from 1988 through to 1990. This last-of-line model is largely based on the Quattrovalvole 5000S, incorporating its 48 Valve 455BHP engine. Taking the 5000S further, the Anniversary has new redesigned aerodynamics for cooling and downforce. Additionally, new brake ducts are incorporated into the rear sills & front dam. The redesigned front and rear kevlar hoods keep to the agressive duct theme as does the optional rear wing. More luxuries such as electric windows and power seats came as standard options. 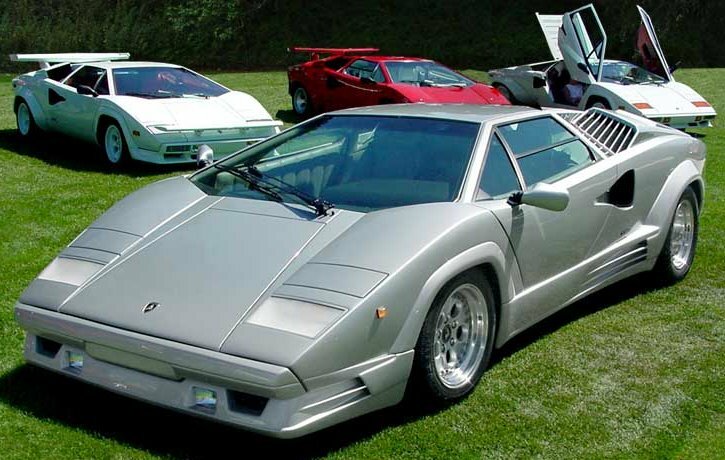 The Countach has innovated since its inception. Like the very first example, the Anniversary sports a massively complex space frame built that supports the car. The cage is centered around a longituindal V12 with a transmission & clutch positioned ahead of the powerplant. A driveshaft runs from the transmission, through the crankcase, to the rear differential. Thanks to this unusual layout, the gearshift is mounted directly to the transmission. This positioning makes for a better front to rear weight ratio, removes the need for any gear lever linkages and provides for more percise gear changes. The only downfall to this setup is the added height of the engine to accomodate the driveshaft. The taller engine provides for a higher center of gravity. The Countach stands as one of the most influencial supercars ever. With its agressive styling and matched performance, many considered the Countach the top supercar from the mid seventies up until 1985.